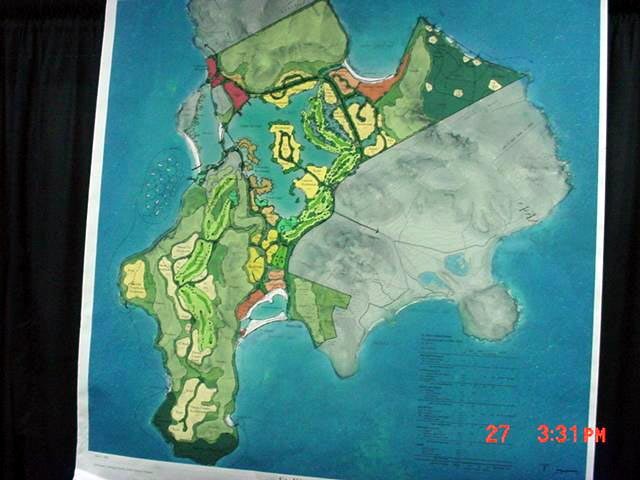 BASSETERRE, ST. KITTS, APRIL 27TH 2005 (CUOPM) – St. Kitts and Nevis sealed a multi-million dollar deal on Tuesday for the construction of the Whispering Head Resort on 1,700 acres of prime private land on St. Kitts’ South East Peninsula. “It (overall project) will have between 250 hotel rooms of various types. It will have a spa. It will have several restaurants and up to 750 residential units,” St. Kitts and Nevis Prime Minister and Minister of Tourism, Dr. the Hon. Denzil L. Douglas announced during a signing ceremony at the Ocean Terrace Inn between the Federal Government and Auberge Firesky Limited, a St. Kitts limited liability company. Prime Minister Douglas said the new tourism development by Auberge Firesky Limited will also boast other hotels, an 18-hole Championship Golf Course and other amenities such as restaurants, taverns, retail buildings, recreational rooms, beach clubhouse and golf clubhouse. “This development will provide a huge boost to us in jobs, tax revenues and other economic benefits for St. Kitts and Nevis,” said Prime Minister Douglas, who said that in the next 20 years, St. Kitts and Nevis would have seen a contribution of some US$17 billion to the local economy. He disclosed that during the construction phase of the Whispering Head Resort hotel, the government will get US$3.5 million. The construction cost of the hotel will amount to US$78 million, while the spin-off effects in the economy is estimated to be US$468 million. “We are very excited and we hope that you will be able to share in the excitement as public sector workers, as our captains in business, in industry and in commerce, we would expect that we would enhance the development of this country in a massive way and thus bring enormous increases and improvement in the quality of life of the ordinary Kittitian and those who aspire as to have wealth,” said Prime Minister Douglas during the ceremony, which was also attended by top business executives, who had earlier attended the launching of the draft Urban Revitalisation Master Plan for the Town of Basseterre. Dr. Douglas said it is not by chance that the Agreement establishes the relationship between the Government of St. Kitts and Nevis and Auberge Firesky Limited. “It is not by chance that we are doing it today, at the very same venue when we have just launched the Basseterre Urban Revitalisation Project for the Town of Basseterre. 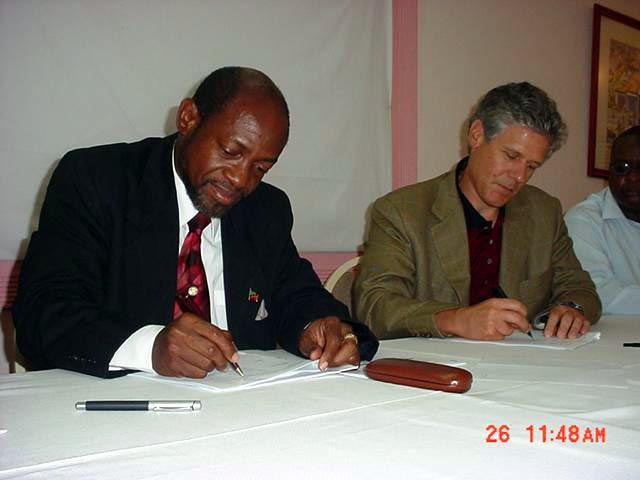 It is not by chance that we are seeing the unfolding of this initiative at a time when we have already made a public declaration that we have to change and diversify the economy of St. Kitts and Nevis away from sugar agriculture and steer it into hospitality services, especially relying on hotel and cruise tourism,” said Prime Minister Douglas. Prime Minister Douglas said although the lands on the South East Peninsula is privately-owned, Government has a commitment to ensure that the development of St. Kitts and Nevis takes place among acceptable guidelines. Chief Executive Officer of Auberge Resorts, Mark Harmon said resort will be built on the property which begins at the Great Salt Pond and extends down to Majors Bay, Sandy Bank Bay and Priddie's Plateau. He said the small luxury resort which will be constructed will be anchored by villas attached to it, the golf course, the world-class spa and a fine dining restaurant. “There will be at least one other hotel which will be in the category of the finest five-star properties here in the world. In addition to that there will be residential development that we hope will set the standard for this type of development in the region,” said Harmon. “We have a handful of properties. We are in many ways a small company, but those properties are recognised around the world as some of the finest in the class of small luxury resorts. The experience that we create in our small properties is one of fine service, exceptional cuisine, original art, a dedication to spas and unparallel service and last but not least, spectacular locations and that is precisely what brings us here today, this spectacular location,” said Harmon, who said what distinguishes St. Kitts from other locations is its people. “It is the dedication and the spirit that I found to date with this Government in moving quickly, expeditiously and very efficiently and effectively to put together an agreement. It is the attitudes and the dedication that I have found in the people who work here that we hope to engage in a partnership and in a process of employment, of investment and betterment of all,” said Harmon. Photo 2: St. Kitts and Nevis' Prime Minister and Minister of Tourism, Dr. the Hon. Denzil L. Douglas (l) and Chief Executive Officer of Auberge Resorts, Mr. Mark Harmon sign the Agreement for the Whispering Head Resort Development on the South East Peninsula.